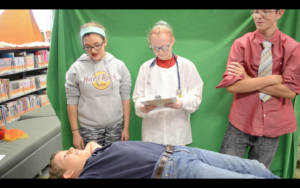 My name is Stephanie Bradshaw, and I am the videographer and unit publicist for this summer’s Teen Moviecraft Program. 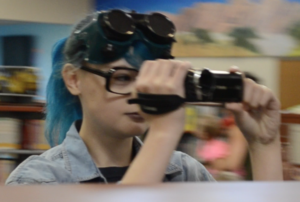 Our team joined together this summer to create a film production crew dubbed Specific Ocean Studios, and together we have worked for seven weeks to create our short film, Finding Sporky. Finding Sporky was written by Carolynn Bradshaw and John Goodner and directed by Leah Khanu and Natalie Knowles. Our film is about a boy named John who throws a party when his little brother Jimmy swallows a spork, and his parents have to take him to the hospital. During the party things go horribly wrong when Steve the Spoon attacks with his army of household items like the Gangster Knives! This film has been a lot of fun to make, and it’s been great getting to see everyone work in their different jobs including set designer, special FX, costume and makeup designer and more. 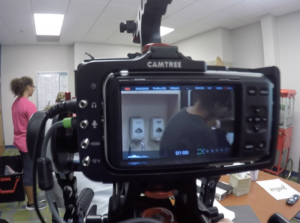 In between filming behind-the-scenes clips and taking pictures, I had the chance to talk to the co-directors about our film. What is your expectation for the film? Directors: Even though we know there may be some bumps in the road, we hope that everything goes smoothly and that our film turns out to be great. We hope that it turns out to be something that we can all be proud of. I also interviewed the screenwriters of our film, Carolynn Bradshaw and John Goodner. Writers: At first we just had a logline (a one-sentence summary of the story), and that gave us a feel of what we were doing. We knew we had this character, John, and he would be attacked by the spoon. Then we collaborated with the team to add other household items attacking people at a party. Once that idea was fleshed out, we had Natalie and Leah bring all of these ideas together into a single vision. Did you enjoy writing this film? It was fun! We got together at the writer’s table with the directors, and we wrote this amazing script. We ended up laughing so much that we could barely get anything down at first. It was an experience that we’ll never forget! It just happened. I (Carolynn Bradshaw) always love coming up with characters that have personalities as crazy and different as you can imagine. These kinds of characters really fit in with our hilarious storyline. With this film being half animated, it took a bit more time and patience to do the stop motion and puppetry. With only two hours a week for seven weeks, we at Specific Ocean Studios definitely had a lot to do, but it was so worth it to finally have our film come together. I can’t wait for you to see Finding Sporky at our Red Carpet Premiere this Friday, July 28 at 6:30PM. All community members are welcome to come watch our film, snack on some popcorn, and talk with us about our project. I hope to see you there! 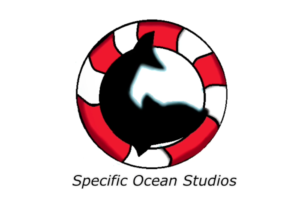 Specific Ocean Studios Logo designed by our awesome graphic artists Chloe Brown, Kaia Briggs, and Kaleb Trujillo!